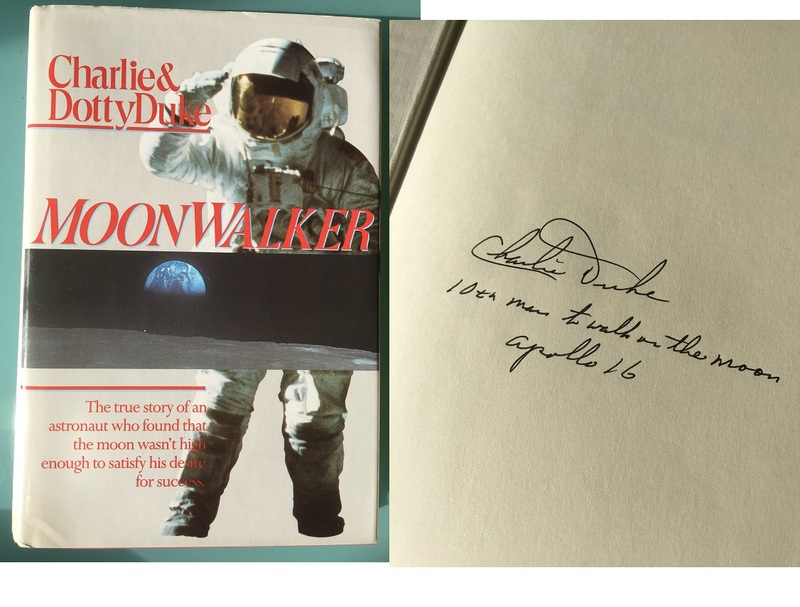 Apollo 16 Charlie Duke - 10th Man On The Moon - Autographed book. In 1969, Duke was a member of the astronaut support crew for Apollo 10. He then served as CAPCOM for Apollo 11, the first landing on the Moon, where his distinctive Southern drawl became familiar to audiences around the world. As CAPCOM, he became the voice of a Mission Control nervous by a long landing that almost expended all of the Lunar Module Eagle's fuel. Duke's first words to the Apollo 11 crew on the surface of the Moon were flustered, "Roger, ... Tranquility, we copy you on the ground. You got a bunch of guys about to turn blue. We're breathing again. Thanks a lot!" making Duke the tenth person to walk upon the surface of the Moon. He also served as backup Lunar Module Pilot for Apollo 17. Duke retired from NASA in December 1975. Apollo 16 was the first scientific expedition to inspect, survey, and sample materials and surface features in the Descartes region of the rugged lunar highlands. on the lunar surface; first lunar observatory with the far UV camera; and longest in-flight EVA from a command module during transearth coast (1 hour and 13 minutes). Charlie Duke - Has added "10th Man to walk On The Moon. Apollo 16"